Princess Anastasia is so dainty! Mr. Bear seems always ready for a party! Loved the royal portrait and the close-ups of Fairy. Just look at her pink lips, she's so kissable. I wonder where Bear and Pixier were during Princess Anastasia's visit. I'm sure they wouldn't have wanted to miss out on the tea party. I don't know where the time goes, I think this must be the longest time I haven't taken photos of the trio. They got their nail trim and weigh in yesterday. Pixie UP 70g! Bear UP 70g! Fairy down 45g. I am not worried, at her last weigh in she was her heaviest ever! Aw, what dolls! Lots of vegetably goodness! That was very polite, Bookfan! I'd go so far as to say Bear is tubby!! Yes, vegetably goodness, indeed, Lynx! What a good description. So nice to see Fairy and her friends. By the way, Mildred, how's your voice these days? Hi Jaqueline! Yes, I really must take some nice, new pics this weekend, I like to see their photos too! My voice is a little better, thank you, quite good at low volume now, but useless on the phone or when i try to speak a little louder. I bought a voice amplifier on EBay, it came today, it could be useful if my voice doesn't improve by April 13 when I am doing a rug making workshop. I know I will need to 'speak up' and that is when it lets me down! How are all your little fairies? Your fairy-whites!? Last page was just gawjus, and the pic on this one too. I use Fairy as my role model for my girl who's a very picky eater. I keep telling her she lighter than a piggy with 1 tooth (I hope that's right). I love looking at everyone's rounded behind. Well done Bear & Pixie. Well, Mildred, my "fairies" are doing well. I actually gave Amelia a little tub bath all by herself the other day and she may have enjoyed it. There was certainly no unpleasant fussing. The drying, afterwards, well that tried her patience I think. Their weight fluctuates much more than the others, and it does make me nervous, especially with the littlest one. Dak and Dash are the big guys - their weights are 930 and 966 grams. The girls are little dainty things. Amelia is only 746 grams, and Billie is a slight 866. Well, one day at a time, and every day is a blessing. They are all happy and spoiled, though not quite as much as Fairy, I suspect. Our day spa is a little less posh, and my English Garden consists of a Christmas cactus and some Snake plants! LOL! Aw! They sound to be doing fantastically well, Jaqueline! I worry about Fairy's weight, it drops a little below 800g and she feels so teeny but compared to Bear EVERYONE feels teeny! 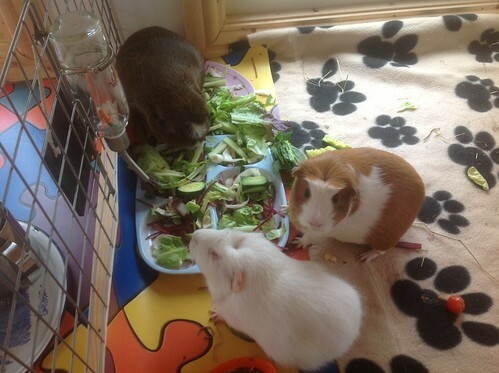 Thank you all and a message from Fairy to your little girl, GP_Mum, 'eat your greens'! And as this is page 49 and as we have a new mouse tale lined up, we will start a new thread! I'll go close this so it's official!